The self imposed trauma is over and the Shirt Tail's hem is picked up and knit. Perhaps the next provisional cast on will go a lot easier - or I bet you all hope it does! It's far from perfect or really even very good but the hem won't fall apart and any non-knitter is not even going to see the stitches that didn't pick up quite right. I think I can duplicate stitch over a few of the worse crossed or oddly picked up stitches but that will be among the very end of what gets done to this epic. To me, the reason for a Knit A Long is to learn new techniques and have a solid group of other knitters standing behind you to catch up as you fall over in a dead faint of exhaustion or to at least give you a good slap and say "get over it!". 1. 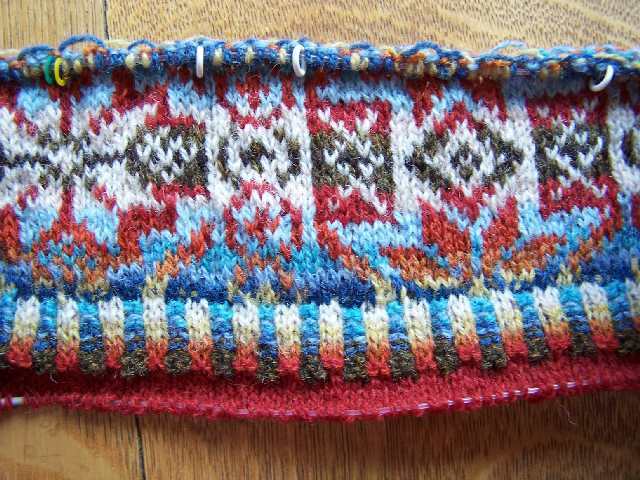 I like knitting Fair Isle even though it is size 2-3 and not size 5-6 needles. 2. I love the feel and colors of Jamieson and Smith 2 ply yarn. 3. Much easier two handed two color knitting then I used to do. 4. Spit splice and Russian join - why didn't I know these techniques already? 5. Corrugated ribbing - fun especially when the dark color is the purl.6. Provisional cast on - PRACTICE, PRACTICE, PRACTICE and next time use a synthetic yarn in a hunter glow in the dark orange as the cast on base and not a medium blue wool. 7. 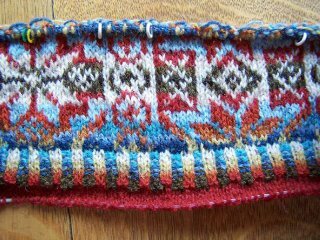 If you are doing provisional cast on, DO NOT allow yourself to immediately do a two color pattern row - do one row in a single color first. This is what was causing me so much trouble with the Shirt Tail hem as I was trying to pick up stitches that had yarn carried behind them. It did NOT pull out easily or quickly. Finally figured out to put the stitches on the needle and then pull out two or three at a time, then go back and fix the carried thread. There are still spots that don't look quite right but I'll fix them at the end with duplicate stitch. 8. Best thing about the KAL is knowing that others aren't breezing along without any challenges and that, by sharing the problems and fixes, we can all learn from each other. Now to decide if I want to loosely bind off the bottom of the hem, fold it under on the purl fold line and whip stitch it down or do what the pattern calls for and Kitchner Stitch the live stitches to the back. Really like the colors in the ribbing and the brick red solid color that gets folded under. I have not yet been able to stretch this piece out enough to see if the curved shirt tail looks anything like the photo/pattern. It is what it is! Great job - it looks beautiful so far. I've never done that type of cast on, thanks for the tips. Hi AnneB, Nice job picking up and working the provisional cast on. You did a beautiful job on Shirt Tail's hem.